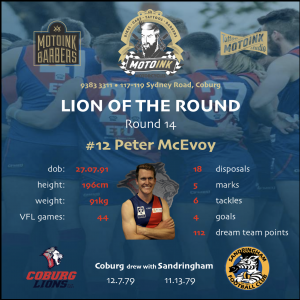 McEvoy Named Lion of the Round for Second Time This Season! Vice-captain Peter McEvoy has been named Motoink Motorcycles Lion of the Round for the second time this year. McEvoy had 18 disposals and kicked four goals, playing a key role in Saturday’s draw. McEvoy has now played 44 senior VFL games since making his debut for Box Hill in the 2014 finals series. He missed the early stages of this season after a finger injury but is now back to his best with his four-goal haul equalling his most at VFL level. McEvoy’s role up forward is to provide a strong aerial contest and create a target for the midfield and defenders moving the ball into the forward half of the ground. “I really focused on my follow-up tackling and forward pressure efforts,” McEvoy said. 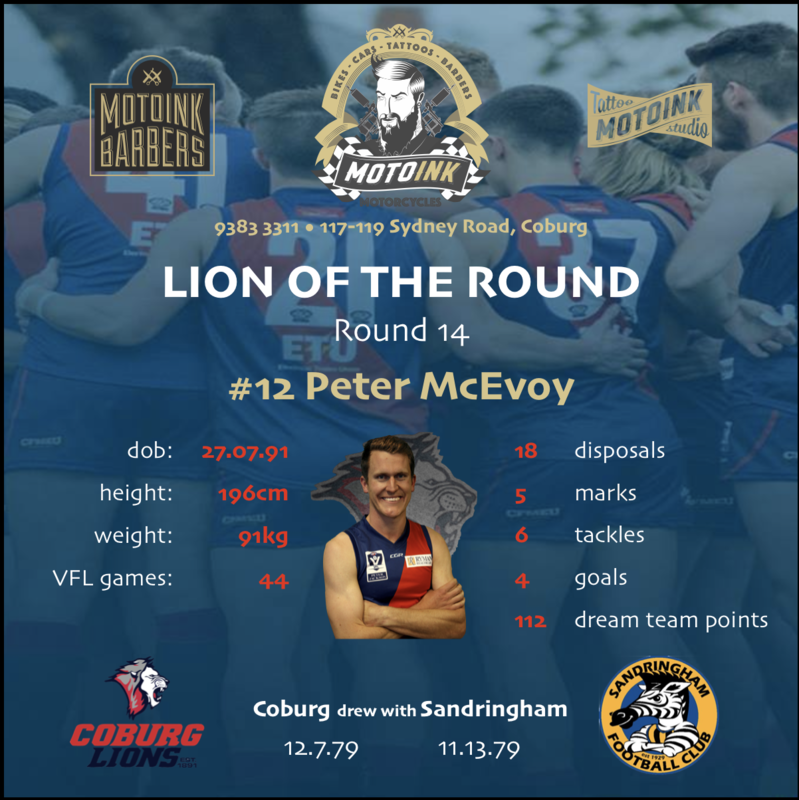 McEvoy thought Coburg’s forward line was very dangerous when it got opportunities. Coburg trailed at three quarter time by 32 points, but turned it around in the last quarter to lead late in the game. McEvoy was pleased with how the Lions bounced back in the final term after being on the back foot for much of the third. “Our midfield really lifted their work rate and dominated the stoppages in the last quarter which allowed our running halfbacks to be super aggressive and influential with their ball use,” he said. Coburg will take a lot of positives out of its first half and last quarter but McEvoy still can see areas that the young team needs to work on in order to get four points on the board. “We have to understand how to wrestle back momentum and lift our work rate and quality on ball movement when we were under such heavy pressure in the third quarter,” he said. McEvoy and his Lions teammates will attempt to carry the momentum built from their six-goal to one last quarter into this weekend’s clash. You can see them in action at Piranha Park up against Frankston at 2pm on Sunday afternoon! This article is sponsored by Motoink Motorcycles – 117 Sydney Rd, Coburg. For more information, check out their Facebook page.